The center tear is, without question, the finest all-around method for gaining information written by a spectator. The main advantage of the center tear is that it is always ready to use, a small slip of paper is all that is needed. In the past, many performers went to U. F. Grant seeking a way to use the center tear effectively. The problem which confronted most of them was how to read the written message without being detected. This problem confronts nearly everyone who wants to use the center tear. And it has been the reason many performers have avoided it. 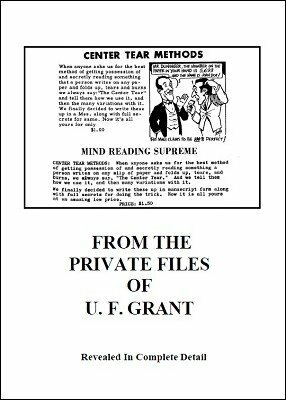 In this eBook are revealed secrets of U. F. Grant previously revealed to only a select few. Read each item carefully and with the knowledge gained you will be able to create miracles! Ten amazing tricks and techniques with the center tear are revealed in this eBook.